Need an open air or indoor space for your annual casual corporate event, or team building training? 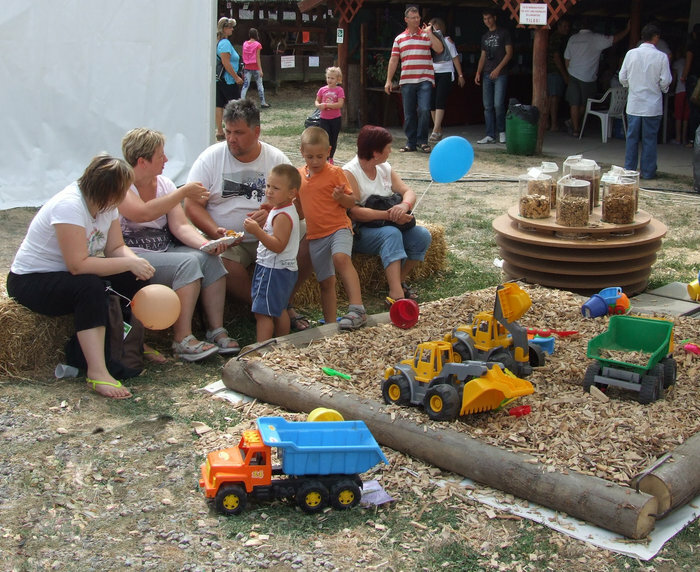 The BMVK Exhibition Center in Szentlőrinc is a perfect place to host your next corporate, family event. Rent one of our pavilions and Oven Court to impress your guests/colleagues with traditional dishes made in the brick oven. Eating organic and tradtitional food is sort of a gastronomic trend lately. Modern society’s men and women got fed up with packaged, canned, and frozen, “fresh-from-the-micro” junk food, spicy pastas, processed snacks, instant soups, deep fried “delicacies” and those special fast meals, that are available in most stores. We can’t deny the advantages of eating convenient food: it is cheap and fast, as it takes less then 15 minutes to fry/heat these dishes and serve them. On the downside: the taste is at best mediocre, your health is at risk (health issues may occur), and of course you won’t recieve praise from family members / colleagues. We believe that the art and joy of cooking is something people shouldn’t miss! The world has changed a lot since the 90s, and Hungary is no exception. As tradtional, rural touristic attractions started to show up, serving the best of long-forgotten dishes, the countryside began to recognize its own values. More and more rural pensions offered traditional food: delicacies made of real dough, special dairy products made of goat milk, beautiful and healthy organic vegetables and fruits grown in home gardens, traditional fat, green or streaky bacons, Hungarian sausages, jams just like our grandparents used to make, food made of honey… Then came the “masonry oven building fever”, and we couldn’t resist the temptation: we built the Oven Court, and we’ve been organizing our own and other companies’ events ever since. The traditional masonry oven is now one of the Szentlőrinci Gazdanapok Agricultural and Food Exhibition’s finest culinary attractions. Showcasing Hungarian, Croatian, Serbian and Swabian food, giving our Visitors an opportunity to taste different national beverages and food has always been a successful part of our events. By building the masonry oven and organizing events our main goal was to show Visitors, Exhibitors and friends the gastronomic beauties of traditional Hungarian and regional cuisine. BMVK Exhibition Center’s renowned traditional Oven Court awaits you too! Should you have any questions do not hesitate to contact us. Our contact information, with telephone numbers and addresses can be found on our contact subpage.